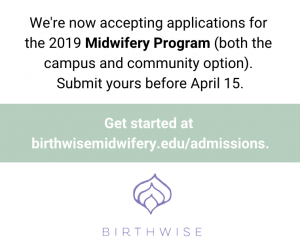 Birthwise Midwifery SchoolLatest NewsNow Accepting Applications for the 2019 Cohort! January 9, 2019 – The admissions season at Birthwise Midwifery School is in full swing! We began accepting applications for the fall 2019 campus and community cohorts in November and an exciting group of prospective students has begun submitting applications. Some of these prospective students visited the Birthwise campus for open houses in October and December to meet the staff, observe classes, learn about the admissions and financial aid processes, and enjoy lunch with current students. More open houses are scheduled in the weeks and months to come. The early decision admissions deadline is February 15, 2019 and the regular deadline is April 15, 2019. Our candidates are a diverse group of individuals who share a common desire to make a difference in their communities as direct-entry midwives. We wish them all the very best!